Sen. Heidi Heitkamp (D-ND), one of the last moderate Democrats in Congress, voted in favor of Neil Gorsuch and had been leaning "yes" on President Trump's second Supreme Court nominee Brett Kavanaugh, until she analyzed his body language. "It's something I do," she explained. "We communicate not only with words, but with our body language and demeanor." She watched both Christine Blasey Ford's and Kavanaugh's testimony. Then, she watched Kavanaugh's again - with the sound off. 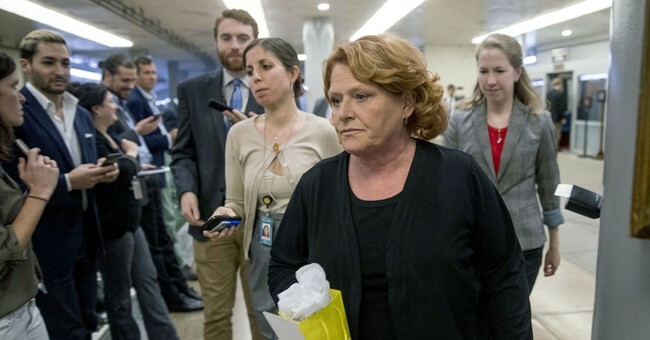 "I saw somebody who was very angry, who was very nervous, and I saw rage that a lot of people said, 'well of course you're going to see rage he's being falsely accused,' but it is at all times you're to acquit yourself with a demeanor that's becoming of the court," Heitkamp said. There were other factors. Heitkamp's experience as a lawyer, she said, gave her pause. She realized that having heard similar stories to those of Ford's, that she believed the accuser. "I certainly think I have expertise beyond a number of people within the United States Senate and that expertise is that I have sat across the desk with victims people I've believed when they told me their story, and I had to say,'I believe you but these cases can't be proved beyond a reasonable doubt so we can't proceed with the prosecution.' And when you've done that, you know for a victim, the most important thing you can say is 'I believe you' if you do, and I think it really came down to that I believed her," Heitkamp recalled. Then there came an unfortunate comment from her Republican challenger Kevin Cramer. Cramer suggested that the women in his family are tough and can't understand the current "movement toward victimization." Heitkamp responded by sharing something very personal: her mom is a sexual assault survivor. "I think it’s wonderful that his wife has never had an experience, and good for her, and it’s wonderful his mom hasn’t," Heitkamp said in an interview with the New York Times. "My mom did. And I think it affected my mom her whole life. And it didn’t make her less strong." Heitkamp's hesitation to vote for a man accused of sexual assault because of what her mom went through is understandable, as is her experience as an attorney. The body language bit? Not so sure. In any case, Heitkamp's change of heart on Justice Kavanaugh probably won't help her in her Senate race. She is trying to keep a seat in a state where President Trump won by 36 points in 2016. The senator is currently trailing Cramer by nearly nine points.